Welcome to the third installment of Meal Review Monday, where I review Pinterest recipe finds. On the menu today: Banana Bread Bars with Brown Butter Frosting. Image from Life's Simple Measures. Please respect the creator and pin from the original site! I had some overripe bananas the other day, and decided I wanted to branch out from my usual banana bread. I perused Pinterest, and decided these tasty bars seemed like just the right thing. That brown butter frosting was calling my name. The bars were quick and easy to prepare, and the result was delicious. They were the perfect texture and density, and the walnuts added just the right amount of crunch. This recipe would have made a good banana bread on its own, but then when you add the delightful melt-in-your-mouth brown butter frosting to the top...oh my. I was in heaven. I won't even tell you how many of these I ate over the course of a few days. It may or may not have been my main source of food for days on end. This recipe makes a huge batch of bars, so if you aren't taking them to a party and only have a few people in your home, you may consider halving the recipe. I didn't, and Hubby and I were eating them for almost a week. Not that we minded, to be sure. The sour cream in the recipe keeps them plenty moist; in fact, my husband asked me what kind of magic I used to keep them moist three days after making them. Although I can't decide if this is a breakfast food or a dessert, I don't really care; I'll eat it for either. You should definitely try it the next time you're in a banana mood. I give it an overall rating of 4 out of 5 stars. Have you tried this recipe? If so, do you agree with my rating? Looking for another way to use up overripe bananas? 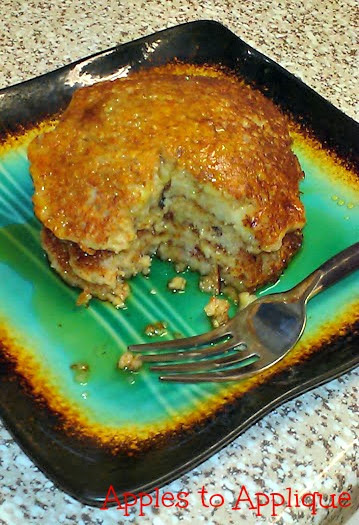 Try my Oatmeal Almond Banana Pancakes for a healthy breakfast treat! Oh my word! Those look absolutely FABULOUS!! :D I'm on a little diet to shed some pounds and let's just say I can't wait until I can get to a comfortable cheating point. I feel ya--I'm on a bit of a diet, too. I do allow myself one cheat day per week, though, and these are worth it! Ooh that sounds so yummy! They really are yummy! Definitely worth trying. I have been looking for more banana recipes! Thanks.. will pin. I'm always in search of good banana recipes, too! I think your family will like this one. Oh man those pancakes look awesome! We never eat all of our bananas before they're too ripe. I'm definitely go to have to keep this in mind! Thanks! We can never seem to eat bananas fast enough, either, but I love baking with the overripe ones, so it works out. I actually pinned that recipe, and now I'll be trying it!